Tuesday not only begins the month of December, but it also starts the beginning of Meteorological Winter! Astronomical Winter doesn't begin until December 21st. But, why the difference? Astronomical seasons are based on the positions of the earth in relation to the sun. That's why the days change from year to year. Meteorological seasons are based on the annual temperature cycle. You see, meteorologists and climatologists break down the seasons in three month groupings: Meteorological Summer: June, July & August. Meteorological Fall: September, October & November. 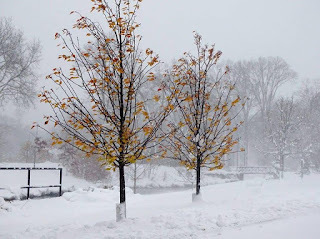 Meteorological Winter: December, January & February. Meteorological Spring: March, April & May. We typically think of winter as the coldest time of the year, while summer is the warmest. Based on monthly average temperatures, the coldest three month period falls during the months of December, January and February - hence Meteorological Winter. The same holds for Meteorological Summer. Fall and spring are considered the transition seasons and are broken up accordingly. Having a consistent three month period not only benefits meteorologists and climatologists from an observing and forecasting standpoint, but it's also easier to develop seasonal statistics from the monthly statistics. It would be much more difficult to figure out monthly and seasonal statistics if the days on which the seasons started changed frequently. Even if it were by one day. A Return to Wintry Weather? We are starting off the work week with wintry weather. Everything from rain to sleet to freezing rain to even snow has been reported this morning as precipitation is running well ahead of the main low pressure area that is still located back in the Central Plains. Since we are so far ahead of the low, we are still seeing cold air remain in place. As a result, the precipitation this morning has been frozen for many locations. However, temperatures will moderate through the morning as the low moves closer and pulls in warmer air. We will top out in the lower 40's today with scattered rain showers possible at just about any moment. 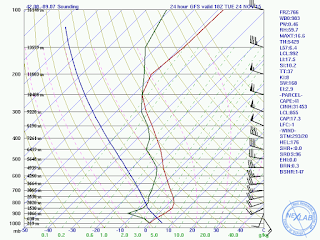 More concentrated rainfall appears likely as we head into this evening and tonight. By the time all is said and done, locations could pick up a quarter to a half inch of rainfall. The rain will come to an end by early Tuesday morning as the low lifts up into Minnesota and Wisconsin. We will dry out from Tuesday morning into Tuesday evening, but we will see some wraparound moisture on the back side of that low move in Tuesday night into Wednesday. 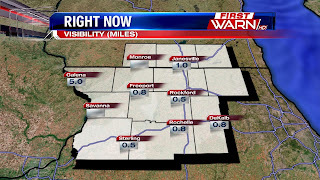 Winds will have shifted to northwesterly by that time, which means colder air will be filtering into the Stateline. Therefore, any precipitation that we can squeeze out will fall as a light mix or light snow showers Tuesday night and Wednesday. While snow flurries and snow showers could fall during this period, accumulations do not appear likely. Some of the forecast models we use here in the Weather Center suggest up to an inch of snowfall on the ground by Thursday morning. I think that may be overdoing it a bit. Thus, I have left accumulating snow out of my forecast. I think a dusting on grassy surfaces could occur overnight Wednesday into Thursday, but anything more than that does not appear likely at this time. We had a soggy Thanksgiving and a cold and cloudy Black Friday. Today was also rather cold and cloudy. We will see a change for the better for your Sunday with sunshine expected. Clouds will increase through the day ahead of our next system that will move in on Monday afternoon. 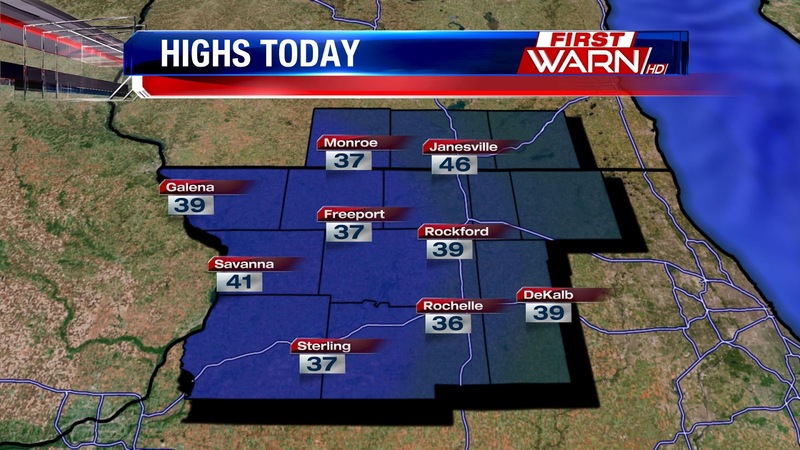 The sunshine we do see will allow temperatures to warm into the lower 40's for most of the Stateline. The sun won't last long because low pressure out across the Central Plains will send cloud cover our way Sunday night and Monday. Rain then moves in Monday afternoon and increases in intensity and coverage Monday night into very early Tuesday morning. The low will stay off to our northwest this time, which is key because that means we will be to the east of it. Therefore, we will be in the warm sector of the system, which means we will see entirely rain through Tuesday. Currently, it looks likely that we will see roughly fourth-tenths of an inch of rainfall with this system. As the low moves north, it will get caught up in Minnesota and Wisconsin. With it remaining there for a few days, winds will turn northwesterly on the back side of the low (colder air). That means we will see clouds and potentially some very light showers or flurries Tuesday through early Wednesday with the wraparound moisture from that low. The chances of seeing precipitation Tuesday afternoon into Tuesday night are not particularly high, but the chance is there for some light rain showers or flurries as the colder air filters in. This rainfall will add to the above average month of November in terms of precipitation. Thus far this month we have seen 5.02" of precipitation. That is nearly three inches above normal. With the rain expected Monday, our monthly totals will likely end near 2.50" above average. December looks like it will be drier than November as it stands now, per the Weather Prediction Center. The month of December was expected to be warmer than average when the outlooks were released months ago. The pattern has continued to appear that way as we approach the first day of December. Warmer than average temperatures appear likely across the northern half of the country with the higher probabilities of seeing those warmer than average temperatures existing across the Northern Plains, Upper Midwest and Great Lakes, including Southern Wisconsin and Northern Illinois. The reasoning behind the warmer than normal temperatures for the Pacific Northwest and North-Central United States is because a strong El Niño taking shape this winter, in addition to blocking of the upper level pattern (high pressure) that is located over the North-Central Atlantic Ocean. Another aspect of El Niño for the Illinois and Wisconsin region is less-than-typical precipitation. As the full effects of the El Niño pattern settle in during December, we will begin to see a shift in the pattern to drier than normal for the Northern Plains and Upper Midwest. 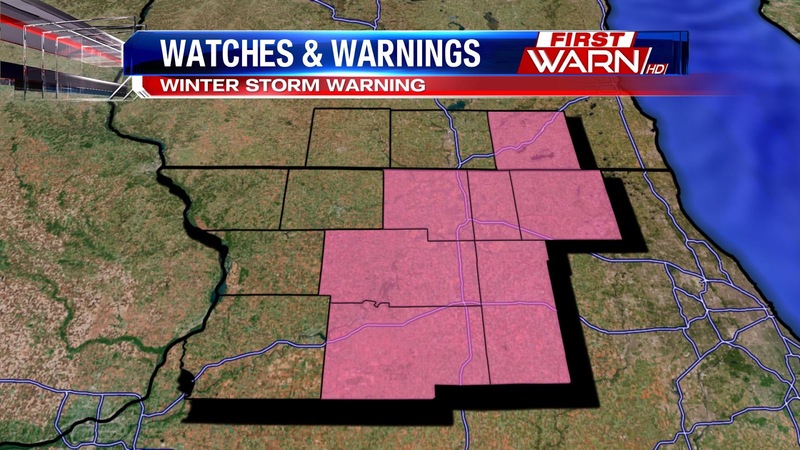 That will begin in December, and the entire winter period is expected to be drier than normal for the Stateline. However, it is with less confidence that we will see drier than normal weather in December than it is that we will see warmer than normal temperatures. This is because temperature trends are showing up with greater evidence of seeing above average warmth. 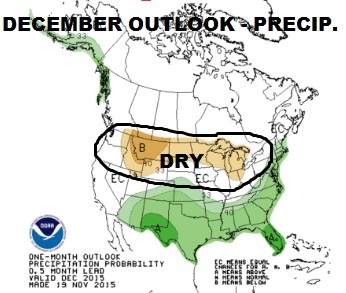 In addition, the drier portion of El Niño may not arrive until January across the region. The outlook for then may feature higher probabilities of seeing below normal precipitation. A slow moving cold front has dumped quite a bit of rain across the Stateline, with totals reaching about 1-2," and more in some places. 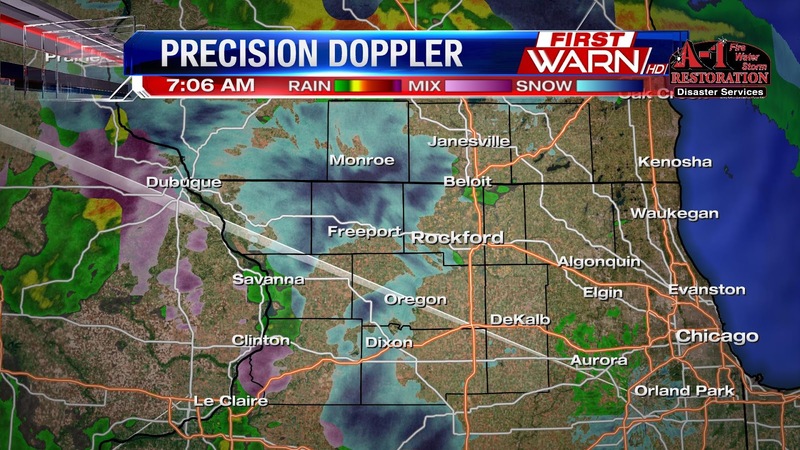 Rockford received about an inch and three quarters, and Monroe picked up over two inches of rain. This broke a couple records for the day; both the record for the 26th and for the Thanksgiving holiday. 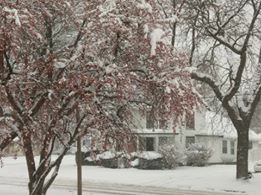 The daily total for Rockford was officially 1.51" beating out the old record of 0.81" from Thanksgiving of 1918, which fell on the 28th. 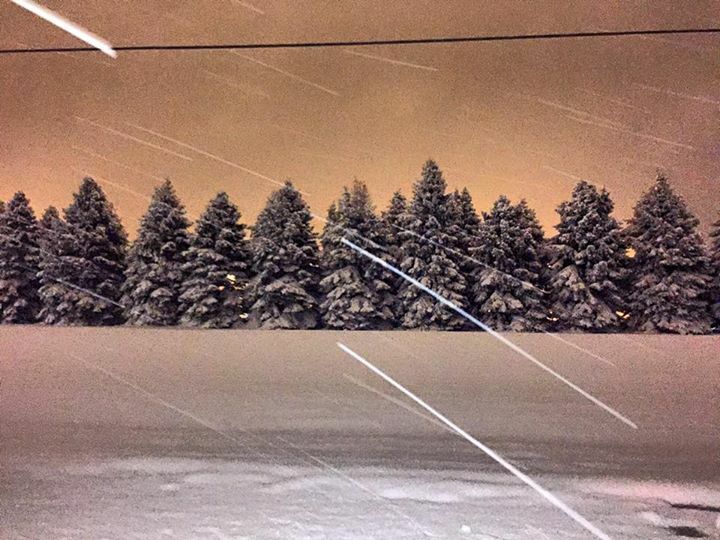 The 1.51" inches Rockford received broke the daily record for the 26th. The old record was recorded in 1934 with 1.30 inches. If you are going to be out and about for Black Friday shopping festivities, rain will be around from Northern New England through Ohio and Indiana, back into the Southern Plains and South Texas. Behind the rain, some ice and freezing rain will be likely as temperatures will be colder and will support the frozen precipitation across Northern Texas into Western Oklahoma and Kansas. Other than this storm system, which extends from Canada to Mexico, the remainder of the country looks to be dry. It will be much colder across the Northern Plains, but it will be mild across the Southeast. Closer to home, the rain moving through Northern Illinois and Southern Wisconsin this evening will continue to fall through the night, sometimes falling moderately to heavily. There have been a few isolated reports of thunder and lightning, but that will remain isolated at best. The cold front will move through the region by later this evening and winds will turn to northerly, dropping our temperatures through the 40's overnight. By the time we wake up on Friday, temperatures will be in the upper 30's and the rain will become more scattered. Therefore, if you are heading out to shop tonight, take the umbrella with you. If you don't plan on being out until after sunrise tomorrow morning, dress warmer as temperatures will be nearly twenty degrees colder, but the steady and heavy rainfall will be coming to an end. 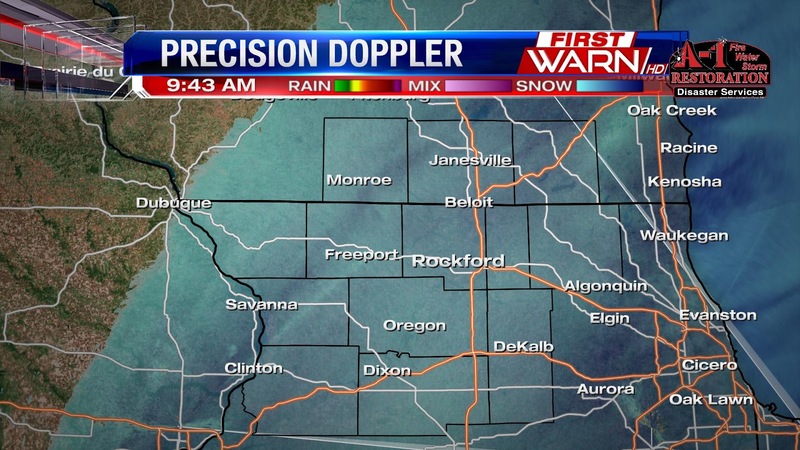 The skies will remain mostly cloudy through the day with isolated showers possible, especially south of Rockford. It will also be a very chilly day as temperatures fall through the middle 30's by the afternoon. Saturday and Sunday are looking much nicer with plenty of sunshine expected, but it will remain chilly with high temperatures in the upper 30's on Saturday and lower 40's on Sunday. 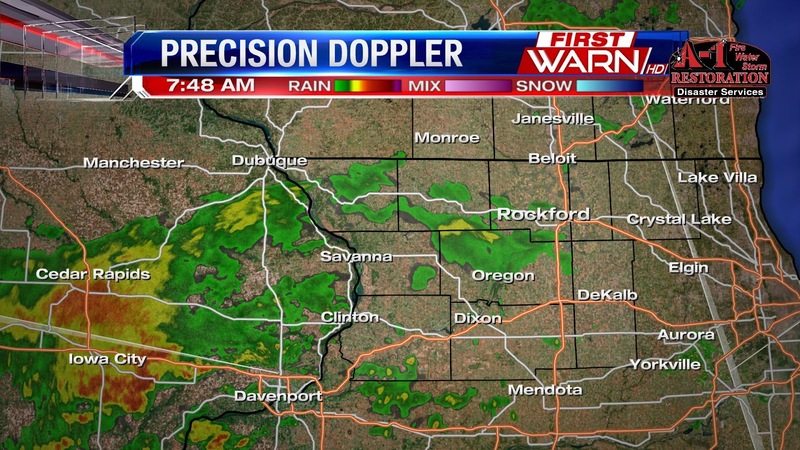 On and off showers are continuing to cross through the Stateline this morning. More rain continues to develop to the north and west along the cold front. 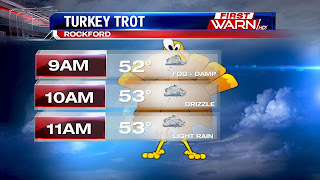 If you're headed out to the Turkey Trot this morning prepare for on and off rain along with areas of drizzle. Overall it is going to be a very damp day with quite a few puddles, from the rain as well as all of the melting snow we've had. Temperatures for the Turkey Trot will be in the lower 50's and temperatures this afternoon will warm into the mid and upper 50's with the help from gusty southerly winds. The heaviest rain will move in this evening, though our far northwestern counties could see the heavier rain a little earlier, because the cold front will be stalled just to the northwest of the Stateline. If you're planning on shopping tonight, you might want to head out a little earlier, as the showers will be more scattered through the early evening, but the heavy rain with the cold front moves through around 10pm and into the overnight hours. The rain will stick with us through the morning and into Friday afternoon before the cold front clears the area. Many winter weather watches, warnings and advisories have been issued ahead of what will be a messy, and potentially dangerous, Thanksgiving in the Plains. Ice accumulations are possible in the panhandle of Texas and Oklahoma as a very strong cold front pulls cold air all the way down into northern Texas Thursday and Friday. 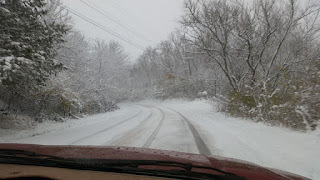 If you're travel takes you anywhere north, northwest or west of here Thursday, be aware for quickly changing conditions. Roads will turn slick, especially later in the day Thursday. Stay ahead of the changing weather with the First Warn Interactive Radar. 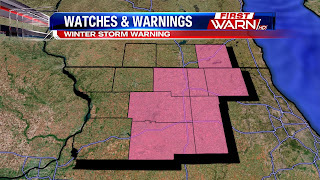 Go to mystateline.com and click on the weather tab. Temperatures Tuesday warmed to the upper 30's, with even a few spots reaching 40 degrees! The warmth will continue to spread northward Wednesday and Thursday. But with the warmth comes the rain. The heaviest rain looks to fall Thursday evening into early Friday morning. That's when most of our accumulating rain will take place. As for rain totals, many will be nearing half an inch of rain by sunset Thursday, with possibly another half an inch - up to an inch - occurring Thursday evening and overnight. If you're traveling Wednesday, locally it will be cloudy. There will likely be drizzle and even a few lighter showers around, but accumulations are not expected to be much. Traveling Wednesday night, fog could be more of an issue with overnight lows only falling to the low 40's. Thursday will be rain for northern Illinois and southern Wisconsin. 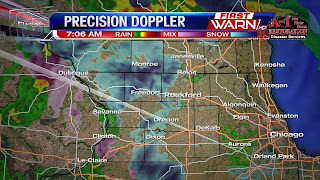 But further north in Wisconsin or west towards Iowa a wintry mix will greet you. Possibly with some minor ice accumulation west of Des Moines, IA. So travel with caution on Thanksgiving if you'll be west of Illinois. For all you Black Friday shoppers, you will need the umbrella and rain gear. With the heavier rain and extra traffic on the roads, be careful driving. Skies will dry through the afternoon Friday and Saturday. Then our next potential weather-maker moves in late Saturday night and Sunday. Get your boots ready this week - you'll need them! 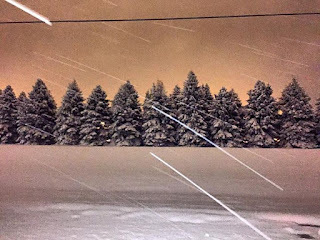 It's been less than a week since a quick moving system dumped just under 9 inches of snow on Rockford, and up to 16 inches in other portions of the Stateline. While a lot of the snow has been cleaned up, it will continue to cause a few more headaches this week as it quickly melts. Expect sloppy conditions as temperatures continue to warm the next few days, and stay above freezing Wednesday and Wednesday night. 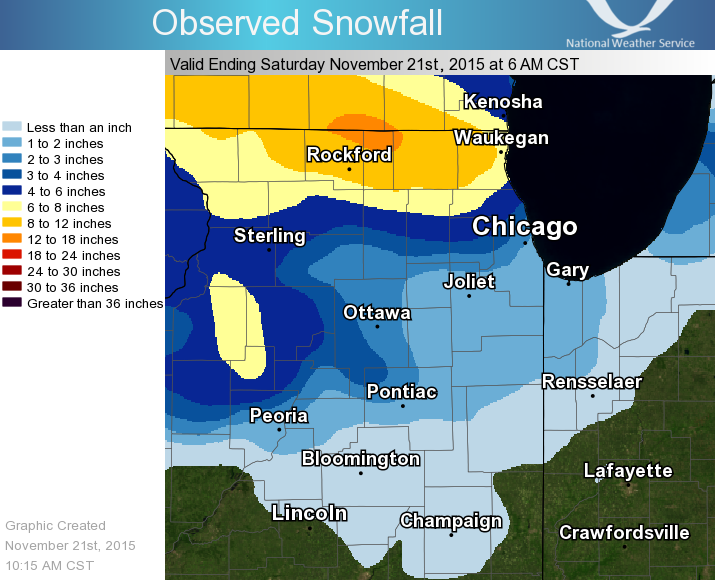 This will cause the snow melt to rapidly increase heading into Thanksgiving. Along with the mild temperatures, rain is likely as we head into the Thanksgiving Holiday. An incoming cold front will bring with it a chance for light showers and drizzle Wednesday night into Thursday, but the bulk of the rain will fall Thursday night into Friday morning. 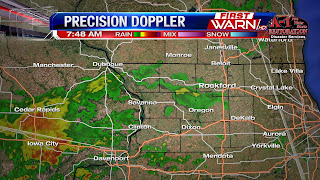 This system has the potential to bring 1-2 inches of rain to the Stateline. 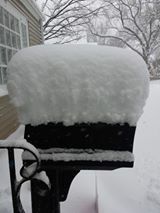 This is quite a bit when adding it to the snow that fell Friday, which is equivalent to about an inch of water as well. When you add together the possible heavy rain and rapid snow melt, we will likely see a rise in local rivers and streams, as well as the possibility for some minor flooding headed through Friday. Forecasting high temperatures can sometimes be a little tricky, especially when a warm up is expected after a freshly fallen snow. For most, highs Monday reached the upper 30's. This was warmer than what I had thought we would be. But hey, at least it didn't end up cooler. A new coating of snow can have an effect on high temperatures during the day, but also low temperatures at night. Even with sun, afternoon highs will be cooler than surrounding locations with little to no snow. The reason? It's a term called: Albedo. Snow has a high albedo. This means that most of the shortwave radiation that is produced by the sun and used to warm the surface of the earth is reflected back to space. Whereas a ground that doesn't have much snow, dirty snow or is bare is able to absorb that radiation. Temperatures Monday afternoon were cooler than surrounding locations. Just look at the highs for today. 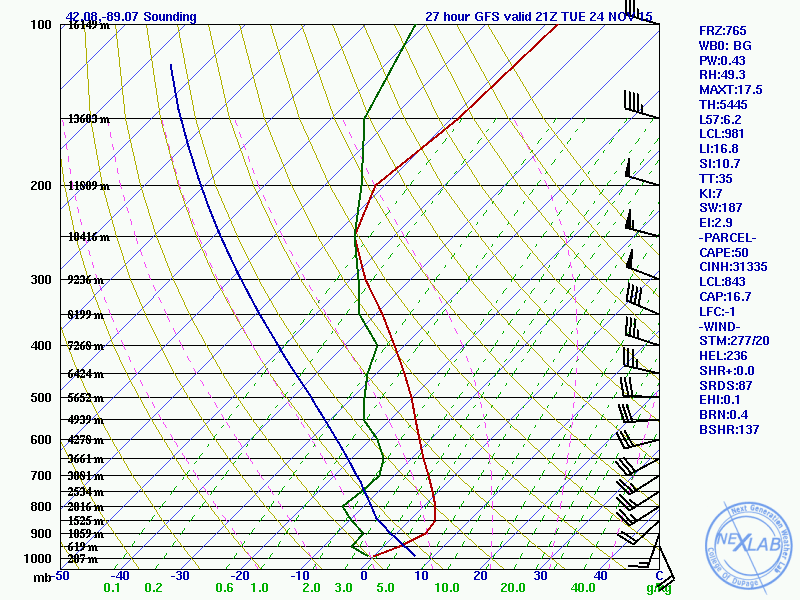 Strong temperature inversions can also hinder how warm afternoon highs reach. This happens when warmer air moves in a few thousand feet above the surface of the earth. Meanwhile, temperatures at the surface don't warm quite as fast. A perfect example of that happening: snow on the ground and winds within the jet stream shifting around to the southwest. Similar to what is going to happen the next couple of days. middle and upper 30's. 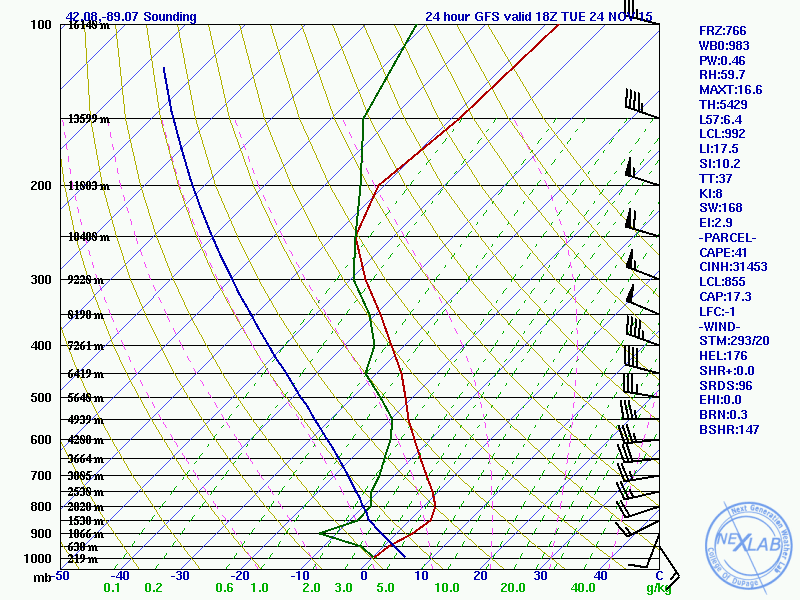 If, however, this inversion does develop and doesn't mix out during the afternoon high temperatures will be lower for Tuesday. After record breaking snow fell Friday night into Saturday, mild temperatures do return the week of Thanksgiving. But unfortunately fog and heavy rain will follow. With the snow pack over a foot and a half deep in some spots, temperatures will remain in the upper 20's to low 30's Monday, middle 30's on Tuesday and upper 30's on Wednesday. Surface winds will slowly shift around to the south late Monday night. With those south winds, more mild air will be pulled north. Melting snow and an added increase in moisture into the atmosphere will likely cause fog to develop during the overnights this week, starting as early as Monday night. The fog will turn a little more dense Wednesday evening and Wednesday night ahead of a warm front and low pressure system. Gulf moisture will be pulled northward with light showers possible Wednesday evening. following Friday afternoon. This will push the rain east into the Ohio River Valley and temperatures will cool into this weekend. Rainfall amounts looks to be fairly high with locations likely picking up over an inch. With the two inches of rain that fell early last week, plus the added snow melt on top of the expected rainfall Thanksgiving, our concerns are growing for the possibility of minor flooding and slowly rising river waters. If your holiday plans have you traveling this week, know that you will be running into rain - with the heaviest falling Thursday late afternoon into the night. Now that we have a snow-covered ground, clear skies, and light winds, temperatures will be allowed to drop very low tonight. 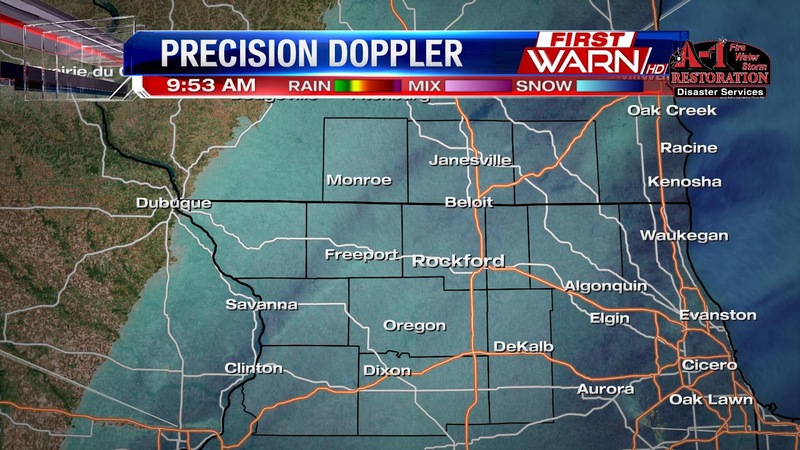 Rockford will likely fall to near 3 degrees. Some areas could approach zero by daybreak Sunday morning. When a light breeze blows, wind chill values will be below zero throughout the night. Some of the wind chill readings could reach as low as -5F across the region, especially where the wind-prone areas are. There could even be wind chill readings slightly colder than that. This will be the coldest night of the year thus far in terms of actual air temperatures and wind chills. Make sure you bring the pets inside and turn on the heat to ensure your pipes don't run the risk of freezing from the extreme cold. Temperatures on Sunday will only rise to the middle 20's despite seeing a decent amount of sunshine. We may struggle to see temperatures reach the freezing mark through Wednesday before a warm surge moves in just in time for Thanksgiving. But, with the warmer temperatures comes a chance for a moderate rainfall...right in time for the Thanksgiving and Black Friday shopping. 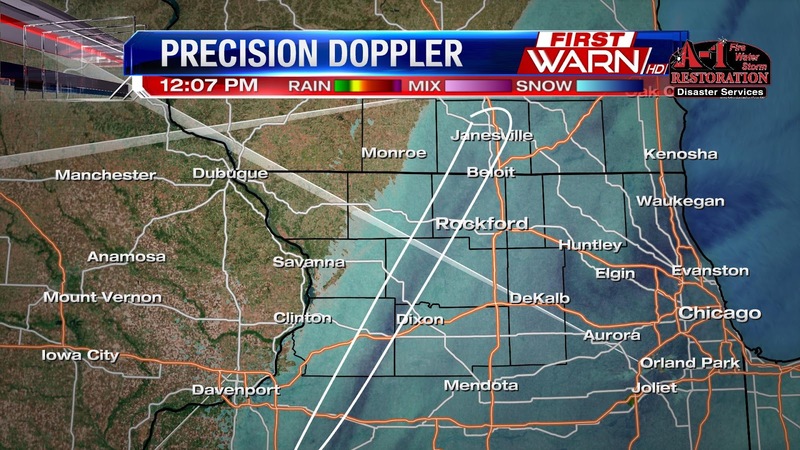 1:30pm Update: Back edge of the snow west of Rockford, with one final heavy band pulling through. Snowfall amounts through this evening have been quite impressive - totals adding up to a foot and a half! 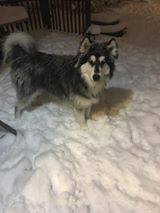 What an intense first season snow. Winds will remain a little gusty into the afternoon, so blowing and drifting will remain a concern in the open areas. Take it slow today if you have to be out. Even though the snow is ending, roads are still going to be a mess. Temperatures are going to drop fast tonight. So anything that isn't shoveled or plowed will probably turn to ice. Slick road conditions will last into tonight and Sunday morning. 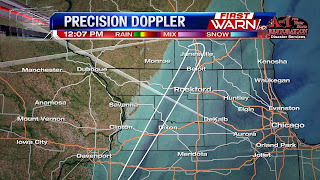 Meteorologist Tyler Sebree will be in later this afternoon with an update on snow totals, as well as the cold. 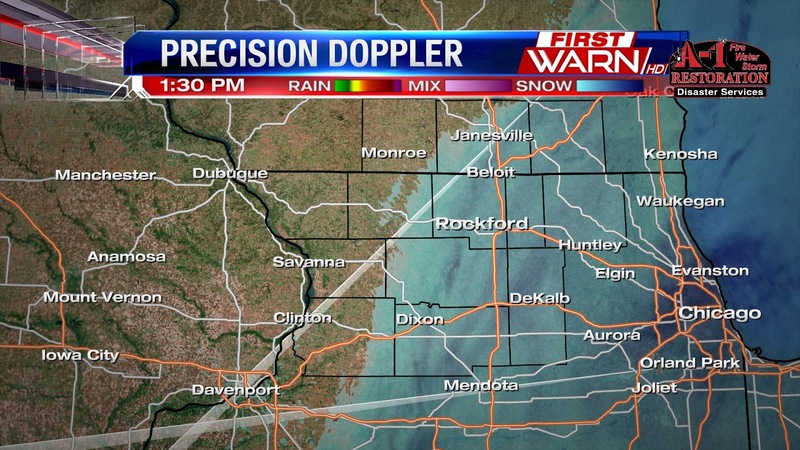 12:05pm Update: Last band of moderate to heavy snow pulling through Rock, Winnebago, Ogle, Lee and Whiteside counties. Visibility has gradually been improving west of that line as the snow is ending. 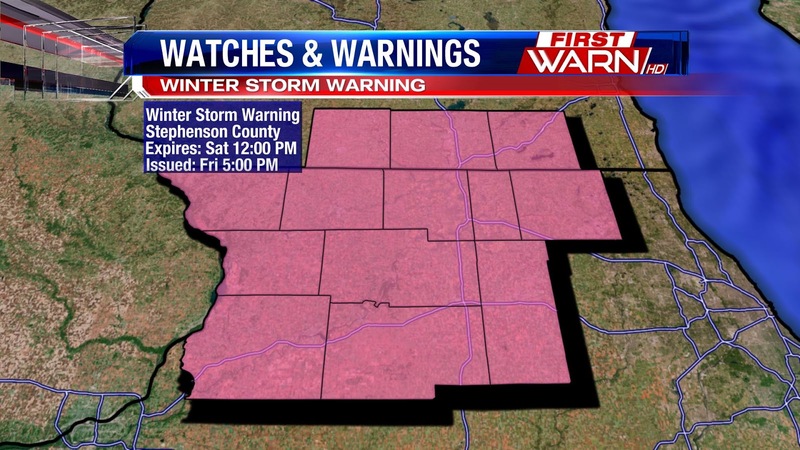 The Winter Storm Warning has been canceled for Jo Daviess, Stephenson, Carroll and Whiteside counties. 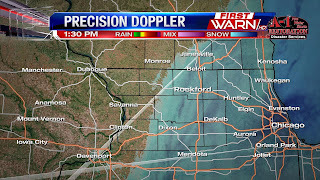 However it continues for Winnebago, Boone, Ogle, Lee, DeKalb, Green, Rock and Walworth counties until 3pm. It's possible this may be canceled early as the heavies snow shifts east. 11:45am Update: While you'll find snow totals at the bottom of this post, here is a preliminary list of observed snowfall totals as of 8am. Now, some of those numbers may be slightly higher with additional moderate snowfall coming through, but notice the counties along and north of Highway 20 and how snowfall observations have been generally over 8". Also, totals adding up to over one foot of snow can be observed north of Rockford in northern Winnebago & Boone counties, as well as in southern Wisconsin. This matches up very nicely with what Meteorologist Tyler Sebree had in his forecast for snowfall amounts late Friday evening. 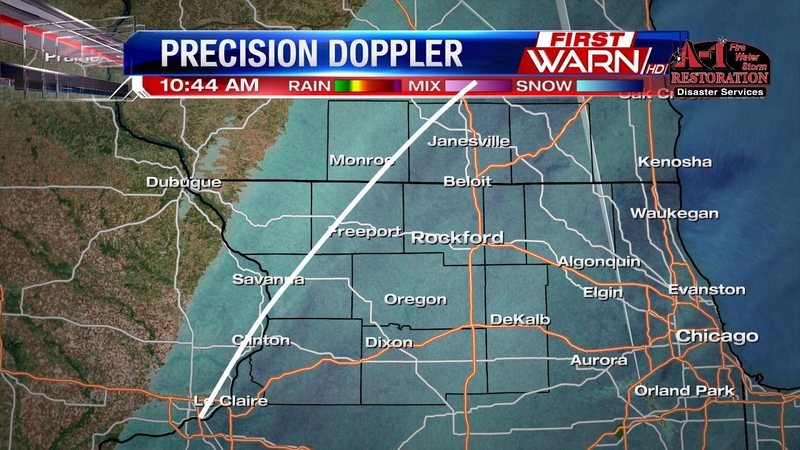 10:45am Update: Heavy snow band east (right) of the white line - so from Janesville, southwest to Freeport. After that, conditions will improve but likely won't be until early afternoon. Growing a little concerned that with the weight on the trees this morning and the wind increasing from the north, we could begin to see some smaller branches break off. Be mindful of that if you're out shoveling or in the snow. And let us know if that does occur. Especially in areas that have experienced snowfall amounts in the double digits. 10:00am Update: Visibility is improving ever so slightly out west near Galena as lighter snow has developed along the back edge of this storm. However, it remains near half a mile everywhere else where still some bouts of heavy snow continue (darker blue showing up on radar). Winds have also increased from the north, with blowing and drifting snow become a major concern in the open & rural areas. 9:45am Update: Visibility area wide remains under one mile. Especially under the heavier snow bands. The system is ever so slowly pulling east this morning, but as the surface low pressure continues to pull through central and southern Illinois, intense lift in the atmosphere has allowed the heavier snow bands to continue this morning. Many areas north of Highway 20 are reporting snowfall amounts in the 13" to 14" range, while south of there reports have come in between 4" and 6". 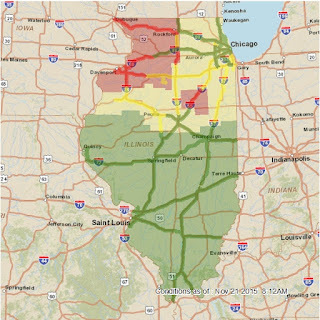 8:30am Update: Road conditions are quickly deteriorating as bands of heavy snow move through northwest Illinois. If you don't have to be out on the roads, don't. 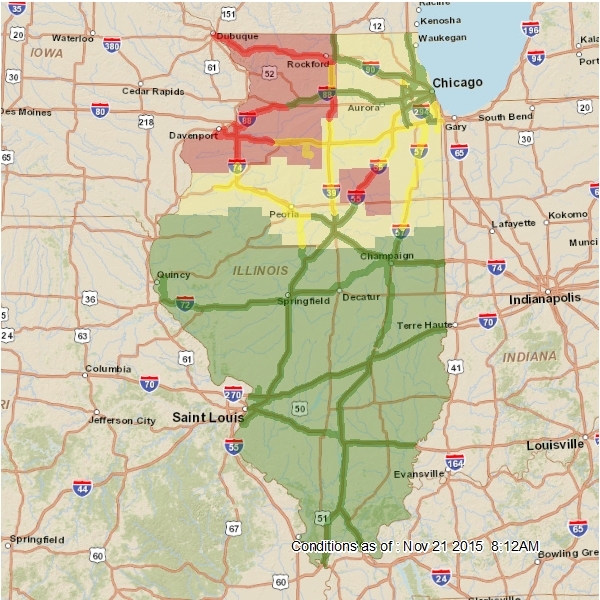 Click here for updates on road conditions in Illinois. Click here for road conditions in Wisconsin. 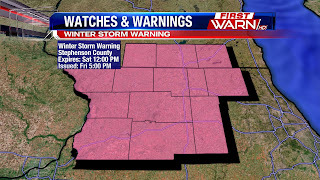 Winter Storm Warning remains in effect for northern Illinois and southern Wisconsin through Saturday afternoon. I'll be the first to admit I am very impressed with the snow totals coming out of this storm! First, from the very heavy convective bands of snow that produced double digit totals late Friday evening, to just how much strength and energy this system has. 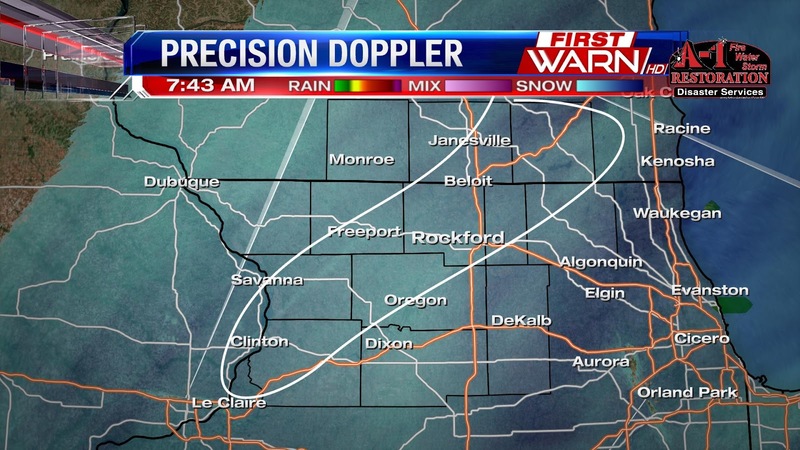 There has been quite a range in snow totals from north to south early this morning, but with heavier snow bands beginning to fill in and the snow turning lighter and a little more fluffy, those numbers to the south of Rockford should begin to add up. Visibility has dropped in northern Illinois and southern Wisconsin and our Eyewitness News Director Scott Picken says the snow is really starting to stick to the roads, making it harder to plow and making it more dangerous to be out on the roads. So, if you don't have to be out this morning it's best to just stay indoors. (12:27:13 PM) nwsbot: Local Storm Report by NWS DVN: Freeport [Stephenson Co, IL] trained spotter reports HEAVY SNOW of M16.0 INCH at 12:25 PM CST -- event total. 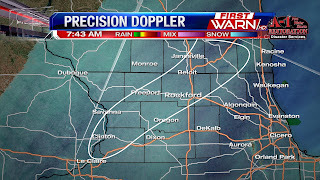 (9:57:55 AM) nwsbot: Local Storm Report by NWS DVN: 5 S Freeport [Stephenson Co, IL] trained spotter reports HEAVY SNOW of E6.0 INCH at 09:52 AM CST -- blowing and drifting snow. average of multiple measurements. (9:04:11 AM) nwsbot: Local Storm Report by NWS MKX: 5 SE Footville [Rock Co, WI] co-op observer reports HEAVY SNOW of M12.5 INCH at 20 Nov, 10:45 PM CST -- storm total for the previous 5 hours. roads are snow covered. 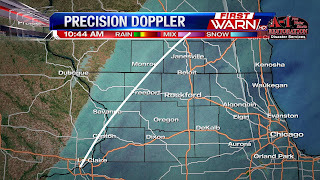 (8:31:07 AM) nwsbot: Local Storm Report by NWS DVN: Freeport [Stephenson Co, IL] nws employee reports HEAVY SNOW of M10.0 INCH at 08:28 AM CST -- lsx nws employee. 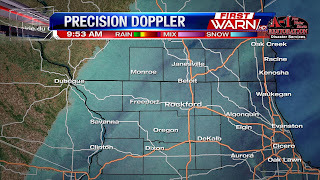 (9:36:23 AM) nwsbot: Local Storm Report by NWS DVN: Freeport [Stephenson Co, IL] trained spotter reports HEAVY SNOW of M14.0 INCH at 09:35 AM CST -- snowfall total so far. Why Did We See 70's Last Week?